Do you see other Art Therapists from Japan? 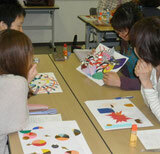 I remember people got together after the International Conference of Creative Arts Therapies in Tokyo, 2006. I keep contact with some of them. I invite some of them as lecturers of my organization. But many of them do not work as Art Therapists. They need other titles to find the job. Ah, you said you are teaching at an art school. Yeah, but I’m teaching for classes as part of program of the Healing Art department, the purpose of which is to draw pictures and exhibit them in hospitals or institutions for the purpose of healing. And it's not my base. Yes, indeed, I hope so. Okay. So, the students of my training course learn a lot through their work. They are fabulous! and revealing …　It's really surprising. Good for you. That means whatever you are doing is working. both in America and in the world in ten years? who uses drawings. And that's not going to change. with the artists and the other people in mental health. need to help people do it better, and the same thing with the healing artists. more with other Creative Arts Therapists. I don’t know if you agree with that. I do agree. And in my training program, my approach is almost the same because it is training for clinicians. They consist of Clinical Psychologists, Occupational Therapists, Daycare Staff, Teachers in Psychology in the Universities, and many others. Oh, so they already know something about pathology and psychology to add to Art Therapy. Yes! So, they have their own identity but still want to learn Art Therapy. themselves or someone they are caring for. That’s when they want to have an Art Therapist. I hope there will be training. So we have just scratched the surface for that direction. But we are definitely in need of the academic training course involving master’s program. We are in need of trained Art after 3.11 East Japan Earthquake and following catastrophe, explosion of nuclear plants, two years ago. Those who suffer from PTSD need to be cared for by professionals who not only encourage them to express their feeling through art but also know its pathology, psychic mechanism and what we should not do as well. Therapy will have cut its way. Oh, you’re welcome! Okay, in ten years is the deal. Okay, let’s talk again then. (Laugh) Bye!